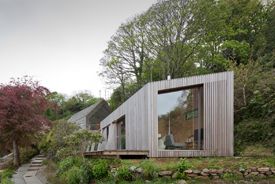 We are delighted to be one of 5 finalists in Grand Designs Home of the Year Award 2014 for a holiday retreat in Cornwall. The judging panel included Kevin McCloud, Phil Coffey, Carl Turner, Lisa Allen & Naomi Cleaver. The contemporary design of this project sits effortless in its surrounding within the World Heritage site. The mono pitch roof building responds both to the sites topography and protects views to the coast from the neighbouring dwelling to the rear. A traditional board on board cladding was used in a contemporary manner wrapping over the roof creating a robust covering to the building within this unforgiving and exposed location. Local concerns of light pollution were cleverly addressed by incorporating timber slats over some of the glazing without compromising on beautiful framed views towards the coastline.